1. 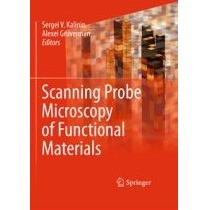 "Scanning Probe Microscopy of Functional Materials", edited by S. V. Kalinin and A. Gruverman (Springer, 2011). 2. 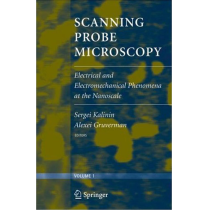 "Scanning Probe Microscopy of Electrical and Electromechanical Phenomena at the Nanoscale", edited by S.V.Kalinin and A.Gruverman (Springer, 2006). 3. 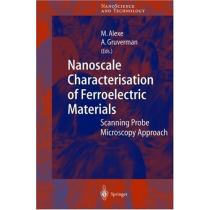 "Ferroelectrics at Nanoscale: Scanning Probe Microscopy Approach", edited by M.Alexe and A.Gruverman (Springer, 2004). E.Y.Tsymbal, A.Gruverman, V.Garcia, M.Bibes and A.Barthélémy, “Ferroelectric and Multiferroic Tunnel Junctions”, review article in MRS Bulletin 37 (2), 138-143 (2012). A.Gruverman, “Recent Advances in Functional Testing of Ferroelectric Nanostructures”, Ferroelectrics 433, 88-106 (2012). D.A.Bonnell, S.V.Kalinin, A.Kholkin, and A.Gruverman, “Piezoresponse Force Microscopy: a window into electromechanical behavior at the nanoscale”, review article in MRS Bulletin 34 (9), 648-657 (2009). A.Gruverman and A.Kholkin, “Nanoscale Ferroelectrics: Processing, Characterization and Future Trends”, Rep. Prog. Phys. 69, 2443-2474 (2006). A.Gruverman, "Ferroelectric Nanodomains", in Encyclopedia of Nanoscience and Nanotechnology, edited by H. S. Nalwa (American Scientific Publishers, Los Angeles, 2004), Vol. 3, pp.359-375. A.Gruverman, O.Auciello and H.Tokumoto, "Imaging and Control of Domain Structures in Ferroelectric Thin Films via Scanning Force Microscopy", Ann. Rev. of Mat. Science 28, 101-124 (1998). H.Lu, C.W.Bark, D. Esque de los Ojos, J.Alcala, C.B.Eom, G.Catalan, and A.Gruverman, “Mechanical Writing of Polarization”, Science 6, 59-61 (2012) [DOI:10.1126/science.1218693]. H.Lu, D.J.Kim, C.W. Bark, S.Ryu, C.B.Eom, E.Y.Tsymbal, and A.Gruverman, “Mechanically-Induced Tunneling Electroresistance Effect in Ultrathin Ferroelectrics”, Nano Lett. 12 (12), 6289–6292 (2012). D.J.Kim, H.Lu, S.Ryu, C.W.Bark, C.B.Eom, E.Y.Tsymbal, A.Gruverman, "Ferroelectric Tunnel Memristor", Nano Lett. 12 (11), 5697–5702(2012). H.Lu, T.A.George, Y.Wang, I.Ketsman, J.D.Burton, C.W.Bark, S.Ryu, D.J.Kim, J.Wang, C.Binek, P.A.Dowben, A.Sokolov, C.B.Eom, E.Y.Tsymbal, and A.Gruverman, “Electric modulation of magnetization at the BaTiO3/La0.67Sr0.33MnO3 interfaces”, Appl. Phys. Lett. 100, 232904 (2012). D.Pantel, H.Lu, S.Goetze, P.Werner, D.J.Kim, A.Gruverman, D.Hesse, and M.Alexe, “Tunnel electroresistance in junctions with ultrathin ferroelectric Pb(Zr0.2Ti0.8)O3 barriers”, Appl. Phys. Lett. 100, 232902 (2012). C.W.Bark, P.Sharma, S.H.Beak, S.Lee, S.Ryu, C.M.Folkman, A.Kumar, S.V.Kalinin, E.Y.Tsymbal, M.S.Rzchowski, A.Gruverman, and C.B.Eom, “Switchable induced polarization in LaAlO3/SrTiO3 heterostructures”, Nano Lett. 12, 1765-1771 (2012). B.Yang, Y.Yuan, P.Sharma, S.Poddar, R.Korlacki, S.Ducharme, A.Gruverman, R.Saraf, and J.Huang, “Tuning the Energy Level Offset between Donor and Acceptor with Ferroelectric Dipole Layers for Increased Efficiency in Bilayer Organic Photovoltaic Cells”, Adv. Mat. 24, 1455-1460 (2012). H.Lu, X.Liu, J.D.Burton, Y.Wang, Y.Zhang, D.J.Kim, A.Stamm, P.Lukashev, C.W.Bark, D.A.Felker, C.M.Folkman, P.Gao, X.Q.Pan, M.S.Rzchowski, C.-B.Eom, E.Y.Tsymbal, and A.Gruverman, “Enhancement of Ferroelectric Polarization Stability by Interface Engineering”, Adv. Mat. 24, 1209-1216 (2012). P.Sharma, D.Wu, S.Poddar, T.J.Reece, S.Ducharme and A.Gruverman, "Orientational Imaging in Polar Polymers by Piezoresponse Force Microscopy", J. Appl. Phys. 110, 052010 (2011). S.Kim, Y.Bastani, H.Lu, W.P.King, S.Marder, K.H.Sandhage, A.Gruverman, E.Riedo, and N.Bassiri-Gharb, “Direct fabrication of arbitrary-shaped ferroelectric nanostructures on plastic, glass and siliconsubstrates”, Adv. Mater. 23, 3786–3790 (2011). R.G.P.McQuaid, L.J.McGilly, P.Sharma, A.Gruverman, and J.M.Gregg, “Mesoscale flux-closure domain formation in single-crystal BaTiO3”, Nature Communications 2, 404 (2011). P.Sharma, T.J.Reece, S.Ducharme and A. Gruverman, “High-Resolution Studies of Domain Switching Behavior in Nanostructured Ferroelectric Polymers”, Nano Letters 11, 197-1975 (2011). Y.Yuan, T.J.Reece, P.Sharma, S.Poddar, S.Ducharme, A.Gruverman, Y.Yang and J.Huang, “Efficiency enhancement in organic solar cells with ferroelectric polymers”, Nature Mater. 10, 296-302 (2011). C.Harnagea, M.Vallieres, C.P.Pfeffer, D.Wu, B.R.Olsen, A.Pignolet, F.Legare, and A.Gruverman, “Two-Dimensional Nanoscale Structural and Functional Imaging in Individual Collagen Type I Fibrils”, Biophys. J. 98, 3070 (2010). D.Wu, I.Vrejoiu, M.Alexe, and A.Gruverman, “Anisotropy of domain growth in epitaxial ferroelectric capacitors”, Appl. Phys. Lett. 96, 112903 (2010). Z.Zhang, P.Sharma, C.N.Borca, P.A.Dowben and A.Gruverman, “Polarization-specific adsorption of organic molecules on ferroelectric LiNbO3 surfaces“, Appl. Phys. Lett. 97, 243702 (2010). A.Gruverman, D.Wu, H.Lu, Y.Wang, H.W.Jang, C.M.Folkman, M.Ye.Zhuravlev, D.Felker, M.Rzchowski, C.-B.Eom and E.Y.Tsymbal, “Tunneling electroresistance effect in ferroelectric tunnel junctions at the nanoscale”, Nano Letters 9, 3539-3543 (2009). A.Gruverman, D.Wu, and J.F.Scott, “Piezoresponse Force Microscopy Studies of Switching Behavior of Ferroelectric Capacitors on a 100-ns Timescale”, Phys. Rev. Lett. 100, 097601-604 (2008). J.N.Hanson, B.J.Rodriguez, R.J.Nemanich, and A.Gruverman, “Fabrication of Metallic Nanowires on a Ferroelectric Template via Photochemical Reaction”, Nanotechnology 17, 4946-4949 (2006). B.J.Rodriguez, S.V.Kalinin, J.Shin, S.Jesse, V.Grichko, T.Thundat, A.P.Baddorf, and A.Gruverman, “Electromechanical Imaging of Biomaterials by Scanning Probe Microscopy”, J. Structural Biology 153, 151-159 (2006). A.Gruverman, D. Wu, B.J.Rodriguez, S.V.Kalinin, and S.Habelitz, "Nanoscale Electromechanical Imaging of Proteins in Human Teeth", Biochemical and Biophysical Research Communications 352, 142-146 (2006). S.V.Kalinin, B.J.Rodriguez, S.Jesse, J.Shin, A.P.Baddorf, P.Gupta, H. Jain, D.B.Williams, and A.Gruverman, “Vector Piezoresponse Force Microscopy”, Microscopy and Microanalysis 12, 206-220 (2006). S.V.Kalinin, B.J.Rodriguez, S.Jesse, T.Thundat, and A.Gruverman, "Electromechanical Imaging of Biological Systems with sub-10 nm Resolution", Appl. Phys. Lett. 87, 053901-903 (2005). J.Shin, B.J.Rodriguez, A.P.Baddorf, T.Thundat, E.Karapetian, M.Kachanov, A.Gruverman, and S.V.Kalinin, “Simultaneous Elastic and Electromechanical Imaging by Scanning Probe Microscopy: Theory and Applications to Ferroelectric and Biological Materials”, J. Vac. Sci. & Technol. B 23, 2102 (2005). A.Gruverman, B.J.Rodriguez, C.Dehoff, J.D.Waldrep, A.I.Kingon, R.J.Nemanich, and J.S.Cross, "Direct Studies of Domain Switching Dynamics in Thin Film Ferroelectric Capacitors", Appl. Phys. Lett. 87, 082902 (2005). B.J.Rodriguez, R J.Nemanich, A.Kingon, S.V.Kalinin, K.Terabe, X.Y.Liu, K. Kitamura and A.Gruverman, "Domain Growth Kinetics in Lithium Niobate Single Crystals Studied by Piezoresponse Force Microscopy", Appl. Phys Lett. 86, 012906 (2005). C.Dehoff, B.J.Rodriguez, A.I.Kingon, R.J.Nemanich, A.Gruverman, and J.S.Cross, "AFM-Based Experimental Setup for Studying Domain Switching Dynamics in Ferroelectric Capacitors", Rev. Sci. Instrum. 76, 023708 (2005). B.J.Rodriguez, A.Gruverman, A.I.Kingon, R.J Nemanich, J.S.Cross, "Investigation of the Mechanism of Polarization Switching in Ferroelectric Capacitors by Three-Dimensional Piezoresponse Force Microscopy", Applied Physics A80, 99-103 (2005). A.Gruverman, W.Cao, S.Bhaskar, and S.K.Dey, "Investigation of Pb(Zr,Ti)O3/GaN Heterostructures by Scanning Probe Microscopy", Appl. Phys. Lett. 84, 5153-5155 (2004). A.Gruverman, B.J.Rodriguez, R.J.Nemanich, A.I.Kingon, A.Tagantsev, J.S.Cross and M.Tsukada “Mechanical Stress Effect on Imprint Behavior of Integrated Ferroelectric Capacitors”, Appl. Phys. Lett. 83, 728-730 (2003). A.Gruverman, B.J.Rodriguez, R.J.Nemanich, A.I.Kingon, J.S.Cross and M.Tsukada “Spatial Inhomogeneity of Imprint and Switching Behavior in Integrated Ferroelectric Capacitors”, Appl. Phys. Lett. 82, 3071-3073 (2003). B.J.Rodriguez, A.Gruverman, A.I.Kingon, R.J.Nemanich and O.Ambacher, “Piezoresponse Force Microscopy for Polarity Imaging of GaN”, Appl. Phys. Lett. 80, 4166-4168 (2002). A.Gruverman, A.Kholkin, A.Kingon and H.Tokumoto, “Asymmetric Nanoscale Switching in Ferroelectric Thin Films by Scanning Force Microscopy”, Appl. Phys. Lett. 78, 2751-2753 (2001). A.Gruverman, K.Hironaka, Y.Ikeda, K.M.Satyalakshmi, A.Pignolet, M.Alexe, N.D.Zakharov and D.Hesse, “SFM Characterization of SrBi2Ta2O9 Thin Films for Nanoscale Memory Applications”, Integrated Ferroelectrics 27, 159-169 (1999). A.Gruverman, “Scaling Effect on Statistical Behavior of Switching Parameters of Ferroelectric Capacitors”, Appl. Phys. Lett. 75, 1452-1454 (1999). A.Gruverman and Y.Ikeda, "Characterization and Control of Domain Structure in SrBi2Ta2O9 Thin Films by Scanning Force Microscopy", Jpn. J. Appl. Phys. 37, Part 2, L939-L941 (1998). A.Gruverman, O.Auciello and H.Tokumoto, "Scanning Force Microscopy: Application to Nanoscale Studies of Ferroelectric Domains", invited review, Integrated Ferroelectrics 19, 49-83 (1998). A.Gruverman, H.Tokumoto, S.A.Prakash, S.Aggarwal, B.Yang, M.Wuttig, R. Ramesh, O. Auciello, and V.Venkatesan, "Nanoscale Imaging of Domain Dynamics and Retention in Ferroelectric Thin Films", Appl. Phys. Lett. 71, 3492-3494 (1997). A.Gruverman, J.Hatano and H.Tokumoto, "Scanning Force Microscopy Studies of Domain Structure in BaTiO3 Single Crystals", Jpn. J. Appl. Phys., 36, Part 1, No 4, 2207-2211 (1997). A.Gruverman, O.Auciello and H.Tokumoto, "Nanoscale Investigation of Fatigue Effects in Pb(Zr,Ti)O3 Films", Appl. Phys. Lett. 69, 3191-3193 (1996). A.Gruverman, O.Auciello and H.Tokumoto, “Scanning Force Microscopy for the Study of Domain Structure in Ferroelectric Thin Films”, J. Vac. Sci. Technol. B14, 602-605 (1996). A.Gruverman, N.Ponomarev and K.Takahashi, “Domain Nucleation During Polarization Reversal in Lead Germanate”, Jap. J. Appl. Phys., 33, Part 1, No 9B, 5536-5539 (1994).